Tummy Time Prop & Play is rated 4.6 out of 5 by 29. Dimension (in) 36" x 32.5" x 5"
Rated 5 out of 5 by KMWC from A tummy time game changer! Our baby Lincoln (4 months old) hated tummy time until we bought the Bright Starts Tummy Time Prop and Play Mat! Thank you so much for such a smart design of a light weight portable mat that allows for flexibility of moving the accessories like the mirror for continuous play and stimulation! The mirror has done wonders in promoting progress as our beautiful boy loves that adorable man staring back at him- his new best friend who he laughs with all.day.long!! I’d love to show you some pictures of him using your product line, as well as to be included on the mom’s panel for ongoing product reviews and feedback! Rated 5 out of 5 by KMWC from A tummy time game changer! Our baby Lincoln (4 months old) hated tummy time until we bought the Bright Starts Tummy Time Prop and Play Mat! Thank you so much for such a smart design of a light weight portable mat that allows for flexibility of moving the accessories like the mirror for continuous play and stimulation! The mirror has done wonders in promoting progress as our beautiful boy loves that adorable man staring back at him- his new best friend who he laughs with all.day.long!! I'd love to show you some pictures of him using your product line, as well as to be included on the mom's panel for ongoing product reviews and feedback! Rated 5 out of 5 by LDH2 from Simple This is a simple product. It is small and soft and fulfills its purpose for tummy time but it's only used for a short time before the child is moving about! Rated 5 out of 5 by Jennalwoodall from Perfect! Finally got this out to see what it will be like. This is going to make tummy time with my little guy so much better! 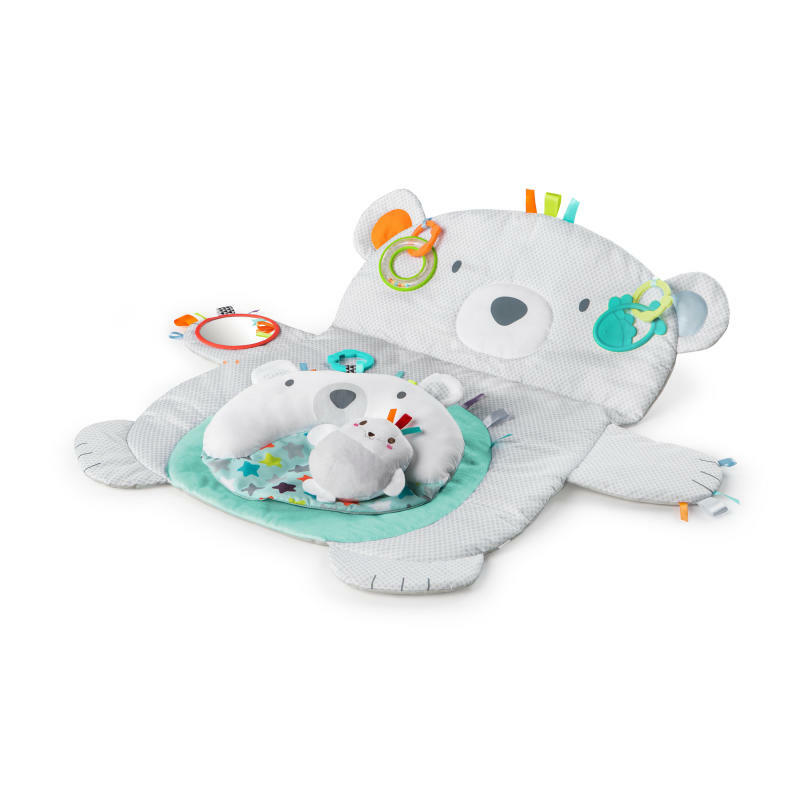 Rated 4 out of 5 by GuertinFamily from Cute and love the accessories I got this a month or so ago because my 9 month old was behind on crawling and it was because he hated tummy time so much! This helped a little! I don't think it's really built for a baby his size, so even though I was frustrated that the head part didn't stay up super well and he pulled the toys off it, I know it'd be perfect for a 3mo. And we now love to use it as a play mat and the accessories will grow with him for a long time. He loves the links, the penguin toy, and the mirror like crazy. Rated 5 out of 5 by garrets from Perfect for our willful baby We got this as a baby shower gift, and while adorable, we weren't sure when we would be using it. We already had a playmat. At what point in her development does she need a Tummy Time mat? As soon as we hear from her daycare that she has been rolling over all over the place and she hasn't done it AT ALL FOR US. SO we broke out the Tummy Time Prop & Play, and set her up on it. It is a lot of stimulation at once, but once she realized that she can play on literally every side (rings, incline, boppy pillow, etc) she loved it. She didn't hate being on her tummy so much, and it helped her leaning up a lot, too. A couple weeks after we started this she rolled over from her stomach to her back. She did it on the prop and play, and I am certain that it helped. I would definitely use this again. But maybe a little earlier next time.